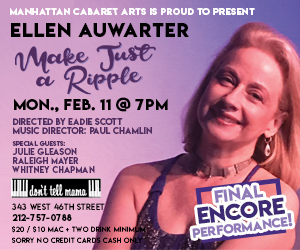 If you don’t know Ellen Auwarter in “Make Just a Ripple – Songs About Life’s Brave Moments,” you should. After three sold-out shows in June and November, the final encore performance takes place at Don’t Tell Mama on Monday, February 11 at 7:00 PM. Cover $20 ($10 for MAC members) and two-drink minimum, cash only. Directed by Eadie Scott and musical directed by Paul Chamlin, this debut show illustrates the story of a “life on the side” in musical theater and song – lived by this cabaret newbie, who has in fact been on the sidelines of the circuit for years. The song list features numbers from the 1930s through today, with stops on Broadway – from Cole Porter to Sondheim – and in the lands of pop and country, with a few movie themes along the way. The show includes special guests.